We have implemented a module “Dynamic Stock Purchase Analysis” which help users to take decision during purchasing products for company from suppliers. It is displaying sold products (from POS and Sales Order) and current stock level based on selected date duration and product categories. And creating purchase order according to quantity enter by user for selected supplier. Here we have done enhancement in our previous development that we made for product quantities in different warehouse. 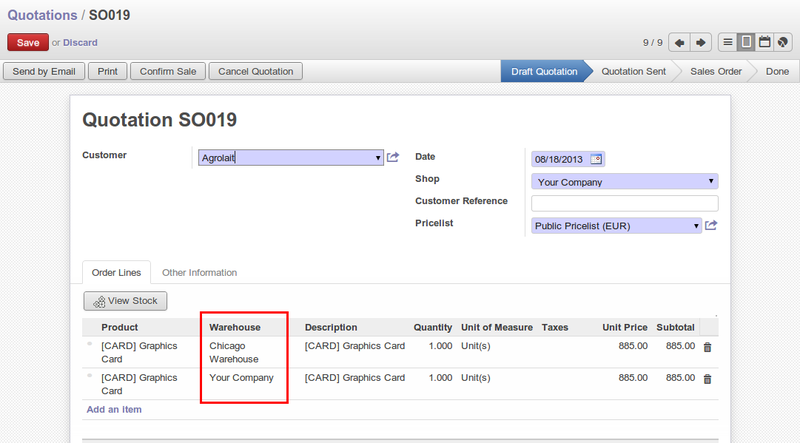 Now, user can see only those warehouse which has quantity for particular product. There are 3 warehouses configured in database but only 2 warehouses have products available in stock. During sales order creating process, we may want to decide that how many quantity can be sold from particular warehouse according to stock availability in our warehouses. So we have implemented easy solution for this. User can know available quantity as well as he can select warehouse also. It’s not compulsory to assign warehouses for each line. In case of empty, it will consider default shop and user can continue his work smoothly. User can perform same process for Purchase Order also which we can see in below screen. In OpenERP, we already have a list of product quantities that is Quantity on Hand, Forcasted Quantity but it actual shows total quantity available in all our warehouse. But let suppose if we have to check warehouse wise quantity then we have to check manually. 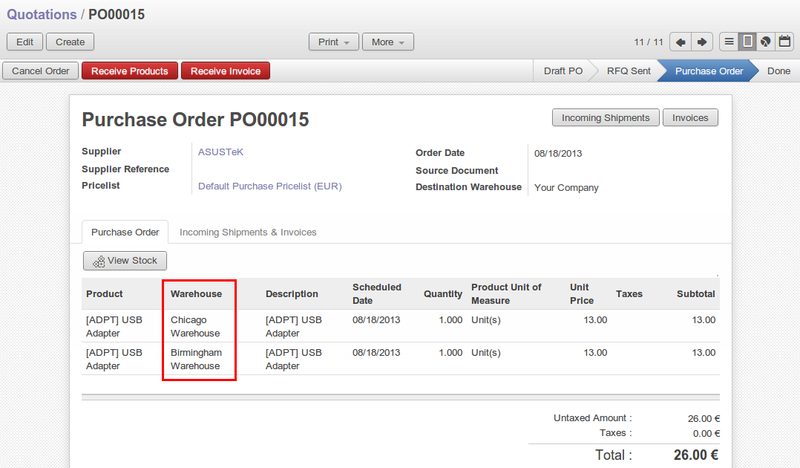 And here we have implemented a module which helps us to get the warehouse wise product quantity. Here is the list of the available warehouse in our database for example. Below is the product form which shows total quantity available. In following screen, we can see that we have added an image field at the last column and when we click on that, one popup will open and that will display all warehouse and quantity for that particular product. The same thing is possible in Sales Order/Quotation, Purchase Order form also if we want to know the quantity during sales or purchase. So here is the flow that how we can maintain and check product quantities during sales, purchase and overall. How to configure product in OpenERP ? While discussing about Sales or Purchase in a business, Product comes into picture always. Product is playing major role in any type of business. In OpenERP, a product can be anything. It may be selling of product, purchasing of product or providing service to customers. You can easily configure product as per your requirements. You will find three major fields available into product form as displayed in below screen. Now let’s see in detail for above fields. Stockable Product: You have to maintain stock of particular product. You can’t do any further operation until you have sufficient stock. Consumable: When you are configuring this type to product, you don’t have to worry to maintain stock for your product. Service: This type of product will configure at time when your company is providing any type of services to your customers. Make to Stock: your customers are supplied from available stock. If the quantities in stock are too low to fulfil the order, a Purchase Order (according the minimum stock rules) will be generated in order to get the products required. Make to Order: when a customer order is confirmed, you procure or manufacture the products for this order. A customer order ‘Make to Order’ will not modify stock in the medium term because you restock with the exact amount that was ordered. Produce: It will define when you will producing product with/without help of other products or services with help of your resources. Buy: It will define when you are buying product from your suppliers. Now see how above combination work with product and make it work for real time.